Over the course of Chinese history, Beijing has been the home of many intriguing and important figures. Along with the rapid progress of Beijing’s modernization, many hutongs (back street lanes) have been rebuilt into broad roads lined with modern buildings. The former residences of some of China’s most important people, however, have been well preserved, holding more value maintained than destroyed. Among these, two residences are protected by the state, and 11 fall under municipal protection. These residences once belonged to notable personages of contemporary Chinese revolution, those renowned in modern and contemporary Chinese culture, and famous historical figures. This is the seventh in a China Pictorial series exploring Beijing’s historical residences. 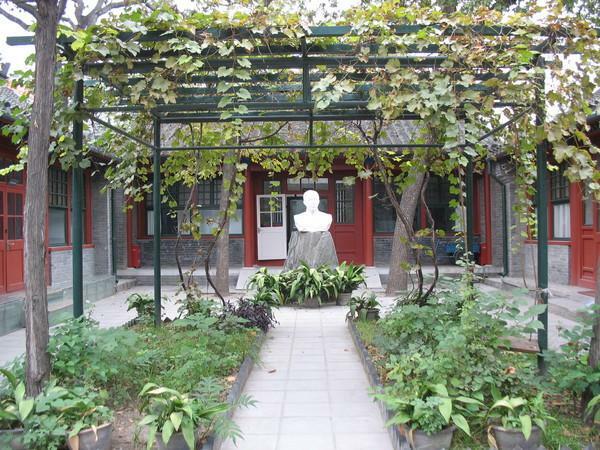 In a small quadrangle at 13 Rear Yuanensi Lane in Dongcheng District, Beijing, is the onetime residence of Mao Dun. Mao Dun, a native of Tongxiang, Zhejiang Province, whose real name was Shen Dehong, was a noted writer, art theoretician and translator. Born in 1896, he began his career as a writer in 1916. In 1920, he translated The Constitution of the Communist Party of the Soviet Union into Chinese, which then became a criterion of The Constitution of the Communist Party of China. One year later, in Shanghai, Mao became the first writer to join the Communist Party of China. In 1921, he published his magnum opus, Disillusion, and in 1937 became editor-in-chief of the magazine Art Battlefield. After the founding of the People’s Republic of China, he acted as China’s first minister of culture, as well as the chairman of the Chinese Writers’ Association. On March 27, 1981, he died of illness in Beijing. Mao resided in the quadrangle at the Rear Yuanensi Lane from 1974 until his death. Entering the front courtyard of the quadrangle, one is met with a screen wall inlaid with a marble plaque that carries an inscription written by the wife of late premier Zhou Enlai, Deng Yingchao: “Mao Dun Gu Ju,” or “the Former Residence of Mao Dun.” The houses surrounding the front courtyard are sitting rooms and libraries. There are also two rooms used to display Mao’s biography and some 400 mementos, including his manuscripts, letters, and literature periodicals. 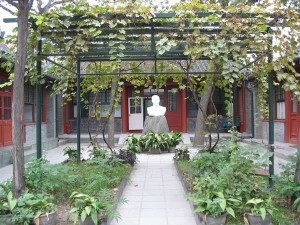 In the center of the courtyard is a square grape trellis, which Mao equipped with a swing. He often played here with his granddaughter. The layout of the main house in the rear courtyard remains the same as it was during Mao’s life. The book cabinet in the living room holds his literary works, including editions translated in various languages. In front of the book cabinet is a pair of folding chairs. Mao used to sit in the one on the left to meet with Chinese and overseas friends. On a big desk against the window are some of Mao’s manuscripts, as well as his magnifying glass and more books. The calendar on the desk is open to February 19, 1981. It was the last page of calendar that Mao Dun personally turned over; he stayed in the hospital following that day. On the right side of the living room there is a door leading to the bedroom. During his last years, Mao had difficulty getting around and did most of his reading and writing in his simply furnished bedroom. A single bed, a pillow, sheet, and quilt remain positioned as they were before his death. Some newspaper clippings he collected and some books that he often read during his last years are piled on a bedside table. Mao kept pens and paper beside him at night so that he could write down his thoughts as he woke up at midnight for reading. On his deathbed, he donated royalties of 250,000 yuan to the Chinese Writers’ Association as a fund to establish the Mao Dun Literature Award as a way to encourage excellent Chinese novelists.